Do dogs look forward to holidays too? You betcha! Our feeling has always been that dogs enrich your holiday experiences, they are the ones that will always go with you for a walk even if it’s when the sun is rising or after the sun has set. 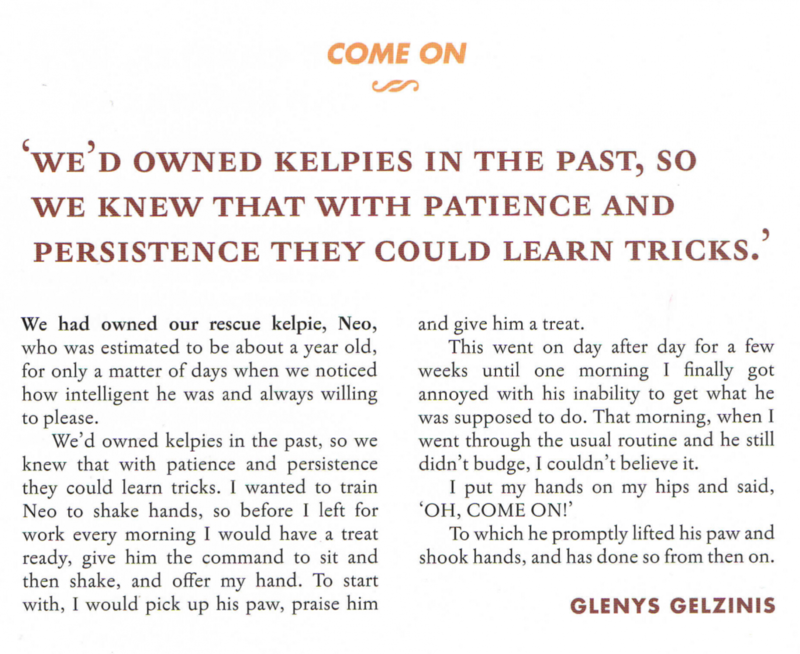 We have always been kelpie owners and we seem to have been lucky in that after the initial mad puppy stage they have been obedient, eager to please, and intelligent dogs. We’ve found them to be the perfect breed, their size make car travelling easy, ours haven’t barked unless on command or when there has been a real reason and they are super friendly to anyone who wants to pat them. Our current dog Neo who I’ve written about before (read more about him in the book ‘ It happened off the leash’) was a rescue dog. We found him through Australian Working Dog Rescue (AWDRI) and after we checked him out and AWDRI checked us out, we’ve been a perfect match. I fell in love with him online as soon as I saw his photo, looking very forlorn in the back of a paddy wagon (council dog catcher’s car) and saw that he was rescued from a pound after being on death row. My first thought was, look at him, he looks like a dingo! I had never seen cream coloured kelpies before and he was a beauty. He did come with a slight issue though in that he has neurological damage from his spine and his back legs are not too great. This basically means he can’t run too much without hurting himself and definitely no jumping! He can however, do some moderate straight line running, loves swimming and is very happy to bounce along a beach and go for a swim, as long as someone will go with him. He is quick to pick up when we are going on holidays, as soon as there is movement and packing of the caravan he is the first one to get in your way and make a nuisance of himself, reminding you not to forget him. He knows he’s home and hosed when his food and water dishes and bed are moved closer to the van. Finally he can relax. I’m sure he’s as happy as us to be watching the scenery go by as we drive. Neo has been a regular with us at quite a few beach holidays in caravan parks and I know that more people know his name than ours. He even has his regular visitors that drop by to say hello and give him a treat. He is happy to relax on his bed and watch the passing parade of people and dogs. One thing we’ve been noticing more of lately on holidays is as well as some caravan parks, dogs are being welcomed more and more in other places too. Just this year Neo has spent time on the deck of a beach café, enjoying the music and doggy treats provided by the owners and he recently got to meet another kelpie at a brewery where dogs are welcome too and yes there were more pats and treats. What a great thing that is. If you’re holidaying with dogs then it makes sense that you will also be touring around with them and establishments that welcome and cater for dogs are definitely getting my business. But for the most part, taking Neo on holidays is all about giving him a holiday too and having his companionship to make us get out and take walks. I just wish I had a dollar for everyone who has asked ‘Is that a dingo?’ Our holidays would be paid for! ← Port Vincent and the Top 5 of driving around the heel. He is a gorgeous dog, and so lucky to have been rescued by you Glenys. Yes, it’s wonderful that more and more places are welcoming dogs. I can’t wait for our new van to arrive so as we take Mr Tills on his first caravanning trip. I think he’s going to love it. Thanks Chris, I bet he will too. Dogs get a lot of attention on holidays. Great post Glenys. Dogs add a new dimension to our camping don’t they? And I can see why Neo gets lots of comments and attention. He’s gorgeous and does look like a dingo.